Categories: Haikai, Micropoetry, Photos, Poetry, Three Line Poetry | Permalink. Wow! Where is this? Alaska? This is in Yellowstone. It was Late October and they just had the first snow of the season. It was stunning and I was so lucky to have been there when I was. I would love to visit Alaska -not sure I would ever come back. This is gorgeous. I really really need to visit Yellowstone. It is amazing. I highly recommend going in October – I went the late Oct. The crowds are gone by then. Of course you might get snow but it probably wouldn’t be enough to shut it down and it is beautiful. 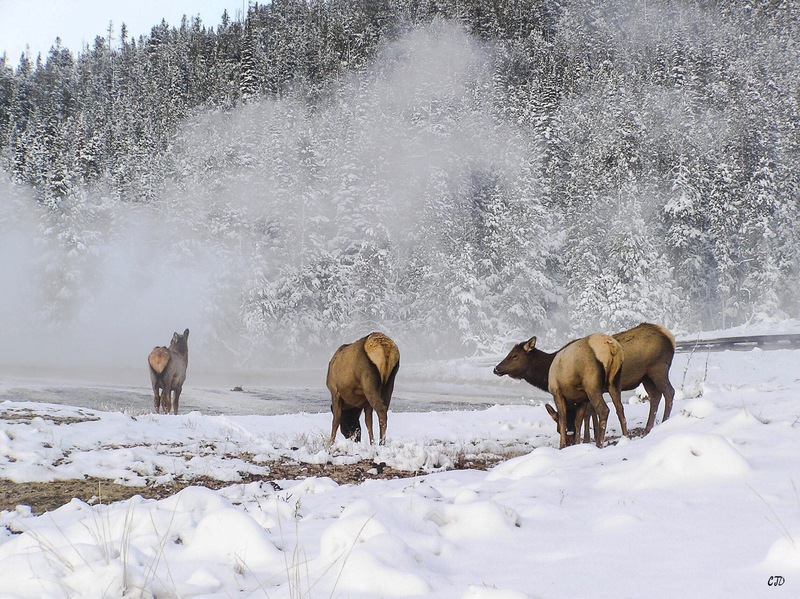 The contrast of the thermal vents and hot pots against the snow makes it even more striking. I like how you mentioned in your comment where this was taken. This was a gorgeous photograph! Nicely written words, too. Thank you. You are very kind. One of the photographers I follow always puts the location, date and camera used in his pieces and I really like it. I might start to do that too. Really lovely photo. Sounds like you visited at the best time. <smile> I was about to ask, “Where dat? Yellowstone?” Then decided to read some comments, first. Now I don’t have to ask. But I do still have to say, lovely haiku working perfectly in harmony with the story told by the photograph. Lovely. Thank you! I didn’t get to venture very far into the park because of the snow so there was a trade off beauty vs. accessibility. The other upside was the weather made the wildlife hungry and I saw a lot at fairly close proximity. I even saw wolf tracks but sadly no wolf :(.